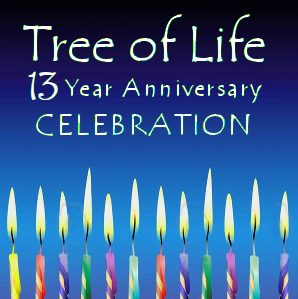 San Diego 's Tree of Life Metaphysical Books and Gifts : You're San Diego Source for Magick, Wicca, Wiccan, Pagan, Witchcraft, Witch, Nature, and Herb supply store- Based in San Diego, we offer books, candles, incense, statues, oils, herbs, root, herbal books, stone, wands, chalices, cauldrons, athame, wiccan and pagan God ,Goddess, and Triple Goddess Statues. We mourn the passing of Raven Grimassi, a well known author, teacher, and Respected Elder of the Craft. You will be missed. What is remembered Lives. 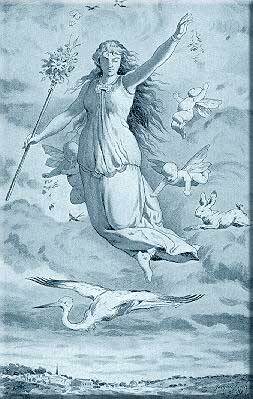 Ostara,(O-STAR-ah), also known as Eostre by the Saxons, is the teutonic Goddess of spring and the dawn. Her festivals are known as Ostara, Eostre's Day, Alban Eilir, Festival of the Trees, and Lady Day. 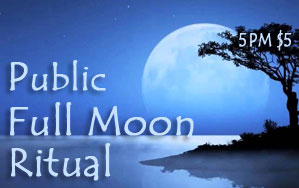 The festival begins on or around the Vernal Equinox, and depending on the traditon can last several days. At this time, the egg laying instinct in some birds, most notably chickens, is triggered by the lengthening of the day and marks the beginning of Spring. The hunting of these first eggs of spring by our hungry ancestors is what eventually gave rise to the game of egg hunting, still played around the world. The beginning of Spring also marks the beginning of rabbit mating season. The antics of male rabbits vying for the favor of females while fighting off competing suitors coupled with their prolific mating habbits gave rise to the Rabbit as not only being a symbol for Eostre, but a powerful symbol of fertility in general. Many of the symbols of the contemporary holiday of Easter come from pagan tales of the Goddess Eostre. One such tells of a hare who of all the creatures of the forest had forgotton to make a gift for the Goddess on the day of her festival. Desperately seeking something to give her, he happened upon an abandoned nest in which lay the first egg of the season. The hare took the egg and colored it with the nectar of the season's first flowers and then rushed to the festival and presented the egg to the Goddess. She was so amused and touched by the Hare's gift that she blessed him on the spot, and ever after he was her constant companion. On this day we celebrate the triumph of day over night as the sunlit hours begin to outnumber the dark. We rejoice in the awakening of the earth around us, decorating our altars with bright colors and and the first flowers of the season. Many traditions mark the beginning of this season with a fast to cleanse any toxins or negative energies from their bodies, breaking their fast only with the first foods of the season. 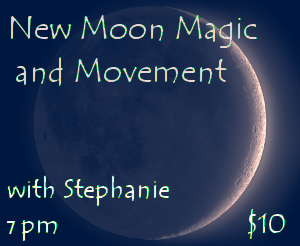 Now is the perfect time for any magick dealing with cleansing, awakening, and new beginnings. The God and the Goddess rejoice in awakening of the world. Nature turns her energies to regeneration and procreation mirroring the play between child God and Goddess as it evolves, giving rise to deeper passoins. The maturing God now begins courtship in earnest of his beautiful Maiden Goddess. 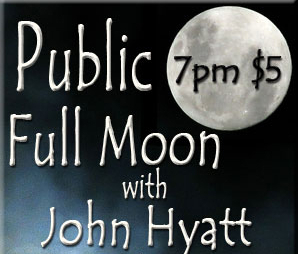 We are proud to offer Phone Readings! Call 619-223-3970 for details! Click a name to view our Profiles! Join us for this hands-on workshop in which students will learn to craft and use their own magical incense blends. 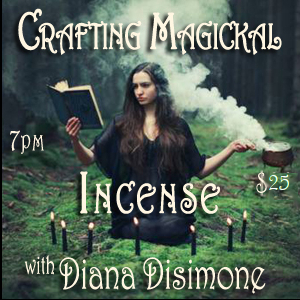 Each student will leave with an understanding of the basic principles of incense magic, as well as magical incenses that they have created themselves for their own magical purposes. Bring your mortar and pestle if you have one! Diana has studied Witchcraft, Wicca, and Goddess Spirituality since she was a young Diana. She is an eclectic solitary Witch who practices a Joyous Ecstatic Tradition heavily influenced by Wicca and Goddess Spirituality. As an active member of the San Diego Metaphysical Community and owner/ operator of Tree of Life Metaphysical Books and Gifts in San Diego Diana teaches many classes on the Craft, including her popular "Crafts of the Craft" series which include Love Magick Workshops, Candle Magick Workshops, Magickal Incense Workshops, and Magickal Amulet Workshops, just to name a few. Want to manifest a goal but feeling stuck? Youâ€™ve come to the right place. Together we will clear barriers with gentle stretching and set a new intention with meditation and candle magic. This month&apos;s theme will be on spring and "planting" the seeds of what we want to manifest this lunar cycle. Please bring a mug for the hibiscus tea we will share. Hibiscus, also known as Japa in Sanskrit, is a flowery tea used to enhance meditation and aid in manifestation. Stephanie has been a practicing witch since the age of 13, and a certified yoga teacher. Her goal is to bring more fun into people&apos;s lives with the classes she teaches. Immerse yourself in a relaxing, restorative sound bath with the Neptune Gong. Planet Gongs are tuned to the orbits of the celestial bodies in our solar system and when played with intention, can open up possibilities for spiritual and emotional healing. All you have to do is lay down and enjoy the ride! About Neptune: It is associated with the root and sacral chakras, the zodiac sign Pisces and assists in all things creative, transcendental, inspiring and visionary. The Mystical, dreams, art, poetry, music, spiritual devotion, psychic abilities and ESP, compassionate, sacrificial, psychic and cosmic awareness. Basic Function: To dissolve out-dated patterns and attachments in order to make room for growth. Neptune points out false projections and illusions, allowing us to reclaim our lost power and follow our bliss. Neptune helps us access the potential for intuition, inspiration, and artistic creativity. It represents oneness, unity, unlimited boundaries, and the element of water. If you are feeling called to explore any of these realms please join us for an evening of sound bathing, journaling, discussion and insight. Please come prepared by bringing what you need to be comfortable. We will be lying & sitting on the ground. A journal and writing utensil will serve you, as often times great insights are revealed that we don&apos;t want to forget! 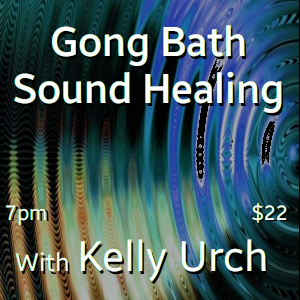 Kelly Urch of Origins Healing Arts, is an eternal student of Life and Death, Yoga Teacher, Sound Healer, Reiki Master and Holistic Health Practitioner. She incorporates a variety of healing modalities in her therapeutic techniques. "Two Dear at Noon" ©John Francis Peters, Used with Permission.